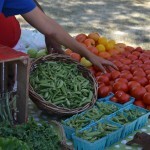 Summer marks the beginning of Chicago’s farmers markets, and four of the city’s five new markets are in Austin. The fifth new market is in West Garfield Park. 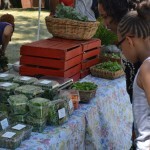 Columbus Park’s market, located at Harrison Street and Central Avenue, opened Tuesday. 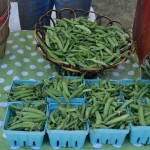 The market will pop up every Tuesday from 1 p.m. to 7 p.m. until Oct. 30. Fresh-food vendors Growing Power and the Fresh Moves mobile market sold produce ranging from leafy greens, tomatoes and pineapples, among other selections of fruits and vegetables. Erika Allen with the local farming non-profit Growing Power, which is headquartered in Milwaukee but has farms in Chicago, said the company will be at each West Side market. 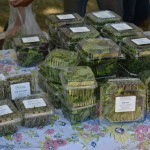 Right now, Growing Power’s sugar snap peas, English shelling peas, lettuce, spinach, salad mix, collard greens and onions are in season, Allen said. 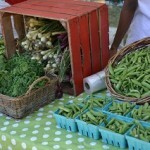 She said green beans, squash and sweet potatoes will come in next from Growing Power’s farms. 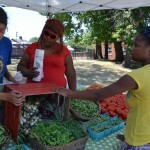 Garfield Park Conservatory volunteer Susan Rashad browsed the Columbus market Tuesday afternoon. 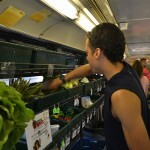 Fresh Moves is a mobile market inside a CTA bus equipped with bins of fruits and vegetables such as apples, kiwis, oranges, greens and potatoes, among others. 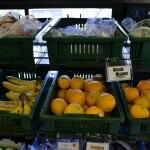 The market accepts cash, credit, debit and LINK cards. 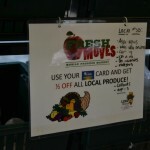 When Fresh Moves has local produce, individuals purchasing the produce with a LINK card receive half off. 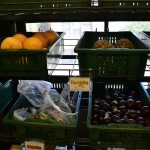 Dara Cooper, senior project manager for Fresh Moves, gave AustinTalks a tour of the market. She said Fresh Moves started May of last year in response to the lack of access to fresh foods in some Chicago communities and the high correlation of heart disease and other illnesses linked to poor diets. 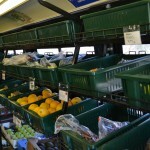 Inside the bus, customers can grab a basket for convenient shopping and also pick up free recipe ideas. If customers have a garden at home or are thinking about starting one, Fresh Moves offers free seeds courtesy of the Hull House. “We really want to help promote people being able to grow their own food,” Cooper said. 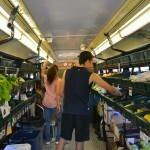 Fresh Moves will be at most farmers markets on the West Side, but customers can check out where the bus will be daily on it’s web site. 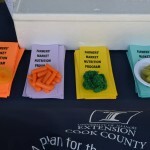 Representatives with the University of Illinois Extension and Loretto Hospital also had tables set up at the market to talk with community members about healthy eating and living. Michele Crawford with the University of Illinois Extension, a grassroots outreach branch of the university that offers community education, passed out pamphlets to customers about nutrition. One pamphlet provided information about berries, including how to store different types, how to determine if they are ripe and quick recipes. “We’re providing really easy, simple recipes that people can use local produce for and some of the health benefits,” she said. Crawford made a peach and nectarine salad with a simple yogurt and cinnamon dressing for customers to sample. Time: 1 p.m. to 7 p.m.
Free programs are available from 2 p.m. to 6 p.m.
Free healthy-lifestyle programs take place from 2 p.m. to 6 p.m. Location: 4941 W. Chicago Ave. Location: 1333 N. Laramie Ave. Location: 3555 W. Huron St.
A Midsummer Night's Dream begins at 6:30 p.m. Aug. 7. 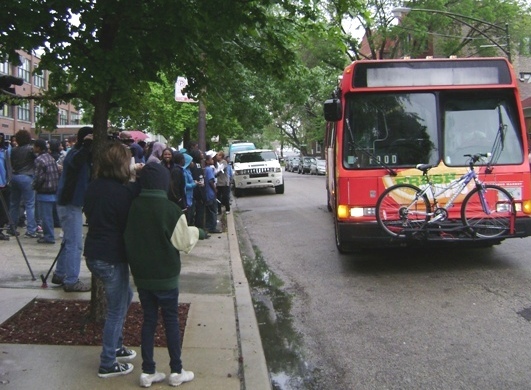 The free event is being sponsored by the Chicago Park District and Boeing. 3,000 people turn out for last week's "Summer of Opportunity"
Elected officials decry the closure and local residents say more investment needed in Austin. Stop at any one of the four Austin locations before they close for the year. The final date for Columbus Park is Sept. 11; for LaFollette Park its Sept. 12; and for the Austin City Market its Sept. 13. 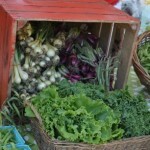 The PCC Austin Farm Stand continues until Oct. 16. 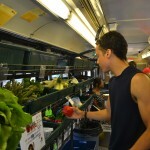 Food Desert Action brings produce to the West Side each week. Check out where you can shop next.